A James Cook University professor has warned that scientists are witnessing a large-scale dieback of mangroves in northern Australia. JCU’s Professor Norm Duke, spokesman for the Australian Mangrove and Saltmarsh Network, said the scale and magnitude of the loss appears “unprecedented and deeply concerning”. The extent of the damage came to light during an international wetland conference in Darwin. 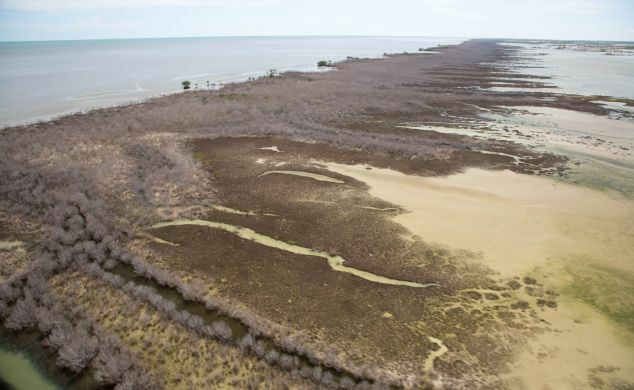 A detailed scientific survey is yet to be done, but Professor Duke said photographs were produced of hundreds of hectares of mangroves dying in two locations on the coast of the Gulf of Carpentaria - at Limmin Bight, in the Northern Territory and Karumba in Queensland. “Shoreline stability and fisheries values, amongst other benefits of mangrove vegetation, are under threat,” he said. Professor Duke said the phenomenon was especially alarming in light of the large-scale coral bleaching of the Great Barrier Reef, as it also appeared to correlate with this year’s extreme warming and climate events in the region. Preliminary observations were presented at this week's Australian Mangrove and Saltmarsh Network Conference in Darwin, hosted by Charles Darwin University Research Institute for the Environment and Livelihoods (RIEL). Professor Duke said understanding of the scale of the mangrove loss is currently hampered by the critical lack of detailed shoreline monitoring, particularly in the remote areas of northern Australia. Professor Duke and conference delegates called for mangrove monitoring efforts to be scaled-up as a matter of priority, so scientists could establish baseline conditions of national shorelines, and quickly isolate and manage dieback events such as those seen in the gulf. He said the next step in the investigation into the Gulf of Carpentaria dieback was to start field investigations to determine the cause and begin appropriate management measures. *Mangroves and coastal wetlands take in 50 times more carbon than tropical forests by area. *Australia is home to seven per cent of the world’s mangroves.